A couple of years ago we had to put down our horse, J.R. We'd had him for 10 years, and he had been a loyal equine companion, living to the ripe old age of 34 (that's old for a horse!). We didn't have the pony yet, so I began searching for a horse to keep Phoenix company. My farrier told me about Zip. I first went out to look at Zip and go for a ride. His owner was timid and had become afraid of him. Zip was basically a clone of how Phoenix used to act at the age of 3 (but without the fear, since he wasn't abused the way that Phoenix was). In fact, they even have some of the same lineage. And they look similar in build. I decided, though, that Zip was a little too much horse and I would prefer to find a horse that Paul could ride. That was when the lady offered to give me Zip. Well, I couldn't turn down free. We got Zip home and he and Phoenix became instant pals. I started working with Zip and he was coming along really nicely. That was about when I got pregnant with the twins. 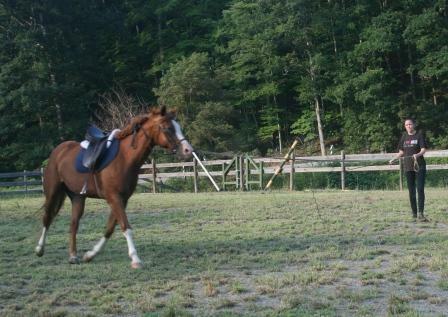 And then he didn't get ridden at all for two years. So we're kind of back to square one. What do you do with a green horse that hasn't been ridden in two years? You break out the lunge line! 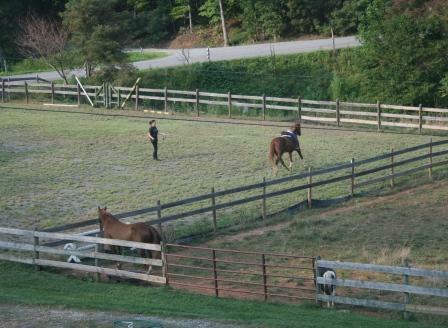 Yes, we desperately need to spray the grass in the arena. Now, the lunge line is a wonderful way to put a horse through his paces. To remind him of his job. And to get out a lot of that extra energy. Prior to hopping on his back. I forgot to put on my hooks to keep the stirrups from dangling, but Zip doesn't mind dangling stirrups. It's good to be working with him once again. He has a lot of potential and a lot of 'get up and go'. You'd never need spurs with this horse. Riding him he has been a little bird brained. He spooks at every shadow, bird, car, butterfly. I think he is in wonderful hands! He sounds like my Cotton - I could count on him to spook at imagined goblins and monsters lurking in saguaro cactus shadows or to see a ravenous creature instead of the actual bunny that we scared. I hope you find some time to work him more! You've got a beautiful farm! children, family & loved ones! We are still stuck in the dark.